Essentially, the thin story nets us an enjoyable Jackie vs. Jet beat down, some impressive visual effects and Jason’s coming-of-age. Maybe I’m being too hard on it. I dunno. I did enjoy the movie, but I just didn’t care. Everything felt too uninspired and by-the-numbers, like a bunch of suits got together and decided to try to make the ultimate family kung-fu movie. When I think about Sky High, I realize where my frustrations stem from. Sky High is a family-friendly take on superhero movies, much like The Forbidden Kingdom is a family-friendly take on kung fu movies. Fair comparison? 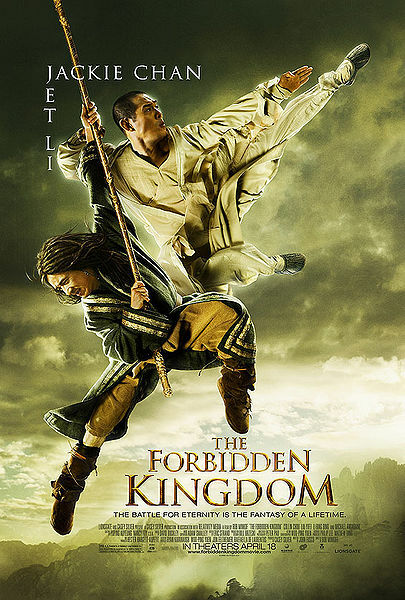 Where Sky High managed to surprise me with its imagination, crack me up with its sharp writing and genuinely pull me in, The Forbidden Kingdom offered nothing new and had me checking my watch. In short, rent Sky High.